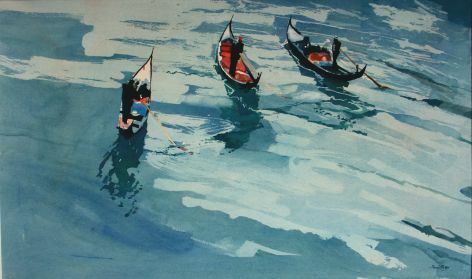 Ian Potts was a highly successful painter and educator, leading the painting department at the Brighton College of Art and exhibiting to great acclaim. 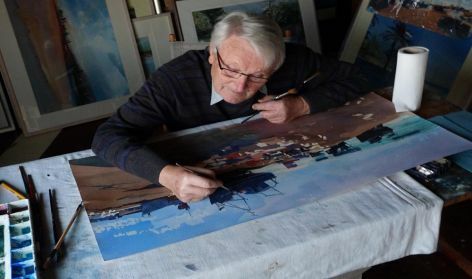 He worked primarily in watercolours, drawing on the traditions of British landscape art in the medium and bringing to it his own dynamic and creative vision. His subjects included the South East Coast of England, the Atlantic coast of France and the Mediterranean. La Rochelle, France. 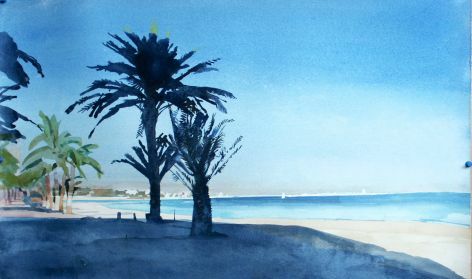 Ian Potts, watercolour. 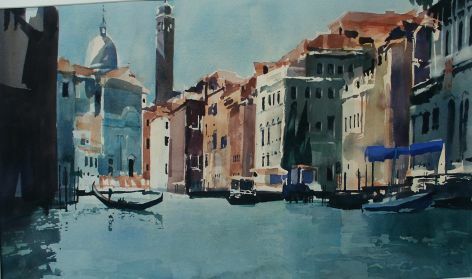 Ian Potts was a highly successful painter and educator, leading the painting department at the Brighton College of Art. 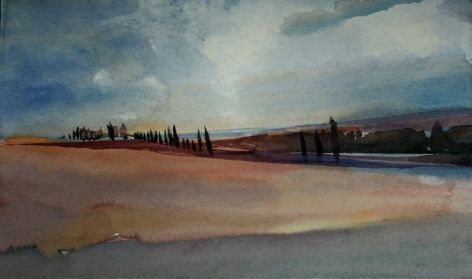 He worked primarily in watercolours, drawing on the traditions of British landscape art in the medium and bringing to it his own dynamic and creative vision. His subjects included the South East Coast of England, the Atlantic coast of France and the Mediterranean. From 1963 until he retired in 1995, Ian Potts was a leading figure in the fine art programme at Brighton School of Art. There he was responsible for assembling a talented staff team that included Antony Gormley, Dennis Creffield, Brendan Neiland and Madeleine Strindberg. Revealing something of the British artist and educator's personality, Josie Reed recalls in her obituary for the Guardian in 2014 that Ian Potts "was a popular tutor, known to his students – who included the Turner Prize winner Rachel Whiteread – as Uncle Ian. A skilled poker player, Ian held his own in games against the head of department, Gwyther Irwin, who reputedly had once earned his living playing poker." He would go on to become Head of Painting and also hold the posts of Course Leader and Deputy Head of Fine Art. Right up to his retirement in 1995, Ian did a great deal both to enhance and to help develop the regional, national and international reputation of an institution which, during Ian Potts' illustrious career, developed from an art school into a polytechnic, before finally acquiring university status in 1992. The exhibition catalogue of Ian Potts Watercolours 2016 is available from the university bookshop. Born into a mining family in Birtley, County Durham, the only child of Noble and Annie Potts, Ian's artistic talent was first spotted at Chester-le-Street Modern School. At 17 he went to Sunderland College of Art, where he studied fine art and won a scholarship to the Royal Academy Schools in London. His graduation in 1958 was distinguished by the award of the Silver Medal for Painting, which led in turn to his appointment to Brighton . In 1959 Ian Potts married Helen Bewick, a fellow student at Sunderland. A little later, a travel scholarship enabled attendance at the British School in Athens: a lifetime of travel would follow, including extensive sketching and painting in Italy and Greece, Egypt and Spain, as well as much of Britain. In the late-1970s, Ian had the honour of representing Great Britain in the International Painting Symposium held at Prilep in the former Yugoslavia. 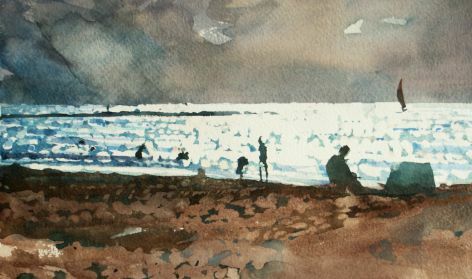 William Packer - principal art critic from the Financial Times 1974 – 2004 said,"Ian Potts is a serious painter, whose work with watercolour is as ambitious as painting need ever be. "While, of the 2016 Ian Potts exhibition at the University of Brighton gallery, Christopher Le Brun, President of the Royal Adademy of Arts said, "I am sure the exhibition will be a revelation to those who do not know of Ian's work and a welcome reminder and deepening of experience for those who do." 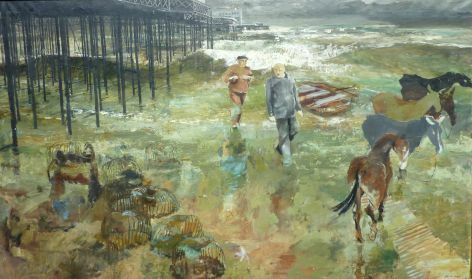 Ian Potts’ work has been added to several public and private collections; including the V&A Museum, London; Arts Council collection; the Towner Art Gallery, Eastbourne; Hove Museum, East Sussex Council; as well as the University of Brighton's Aldrich Collection. Lloyds of London purchased work and Ian was approached by various distinguished publishers to collaborate on special book editions. 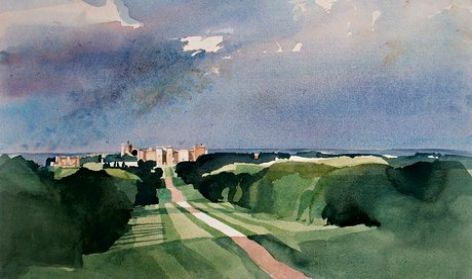 In 1998 St. George's House, Windsor, commissioned Ian to work in the grounds of Windsor Castle in order to paint a work to be presented to the Queen's Chaplain upon his retirement: in the event, two paintings were selected. From very early on, Ian was invited to exhibit at the Royal Academy Summer Exhibition, which he continued to do throughout his life – complementing a wide range of notable exhibitions across Britain, as well as in France and Italy. and he held numerous exhibitions in galleries in Britain, France and Italy; the most recent being in London in 2014. 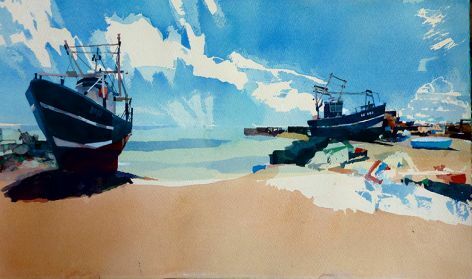 "There are distinctions in Ian’s work which justify the claim that he advanced the English watercolour tradition, just as Cotman and Girtin did before him. 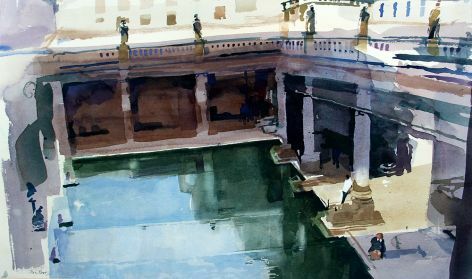 "This can be noted in the scale of the work, which unusually for watercolour can be a close to a metre wide. "But also, Ian loved and explored the particular look, “otherness” and individuality of places. He sensed that a kind of visual shorthand may be present in people in their everyday lives, which has the potential to stop them experiencing this. He had the technique to communicate this inspirational power to the public and yet avoided styles that might sever the link between a painting and its natural inspiration. 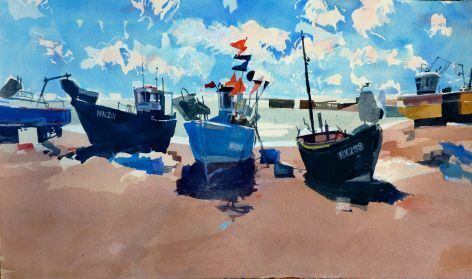 The sense of otherness is also found in several of Ian’s paintings of fishing boats at Hastings. In this painting not only are the boats in some sense ‘over there’, but beached they seem to be ‘out of it’: they sit like knowing pensioners reflecting on their collective history at sea. Ian’s ability to invoke a pause in the viewer’s response is exhibited in many of his paintings; this painting, entitled ‘La Porte Verte’, is an example of how a pause is affected by the separation of the individual subject from the artist and the viewer. 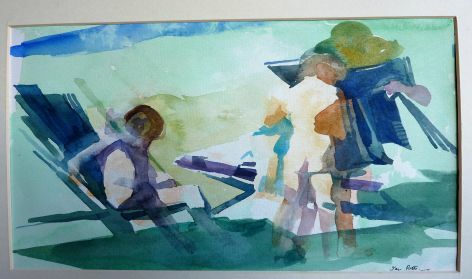 At a time when abstraction and collage are popular, Ian’s work is remarkable for sustaining the representative tradition in English watercolour painting while moving on from the Classical, the Picturesque, the Vernacular and the neo-Romantic styles that mark the history of English landscape painting." "I see painting as a kind of orchestrated building process." Ian said. "When I start a new picture, I don’t make a preparatory drawing with a pencil, but I’ll have worked out a drawing vision in my mind, positioning the horizon and determining where I need to place the dark and light areas. There has to be this mental plan–you can’t put light colors on top of dark in this medium. Together with his wife Helen, Ian moved to Brighton before starting a family. A love of France and good food – Ian was a great cook – led them to buy a house near La Rochelle in 1988. There they had many happy holidays, with Ian becoming a much loved member of the village community, regularly arriving from England with his son, Nigel, and friends by motorbike. Helen, and their daughter Claire, organised the exhibition Ian Potts, Watercolours in 2016 at the University of Brighton gallery. Artist Robin Plummer was Dean of Faculty in Brighton from 1975 to 1989, responsible for the new polytechnic structure and the Grand Parade site. Beginning with Hipgnosis and iconic album covers George Hardie became a Professor at the University of Brighton, and Royal Designer for Industry. Lucy Cousins is one of the world's best-known author-illustrators, receiving global success for her books and characters, most notably Maisy Mouse. Intervention artist and critic Peter Seddon's research work is informed by historiography, crossing genres with complex historical referencing. Jenni Grey is an internationally acclaimed bookbinder working with materials such as wood and metal, and techniques such as embroidery. Keith Coventry studied Fine Art in Brighton from 1978 to 1981 before gaining widespread success after support from Charles Saatchi. Chris Shaw Hughes studied at the Faculty of Arts, graduating with a first class Critical Fine Art Practice BA(Hons) in 2008 a MA Fine Art in 2010. Born in Cologne in 1910, Strausfeld was primarily a woodcut and linocut artist. Head of Graphic Design at Brighton from 1951 to 1974, John Biggs was an educator and prolific illustrator and author. 3D design tutor Sean Hetterley, was warmly remembered by colleagues for his murals at the annual Pottery Party. Artist and illustrator Leslie Cole taught at Brighton from 1946 until 1976. Ian Beck is well known for his cover of Elton John's Goodbye Yellow Brick Road album, as well as a writer and illustrator of childrens' books. Realist painter Sylvia Sleigh was awarded a Lifetime Achievement Award by Women’s Caucus for Art shortly before her death in 2010.